Donald Trump has said a Somali refugee student who went on a rampage at an Ohio campus on Monday "should not have been in our country". The President-elect added that "ISIS is taking credit for the terrible stabbing attack", which left 11 people injured. 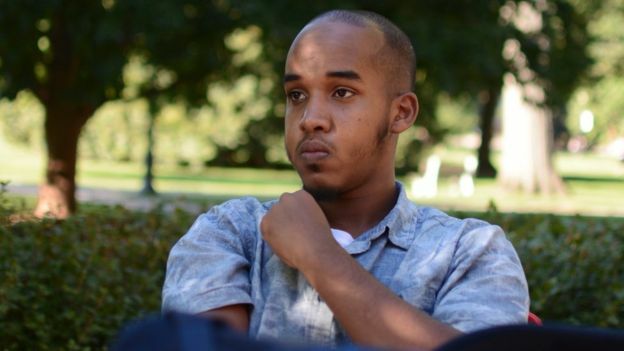 An IS-affiliated news agency claimed business student Abdul Razak Ali Artan as a "soldier". The 18-year-old's mother says he acted normally on the day of the rampage at Ohio State University in Columbus. Mr. Trump has vowed as president to institute an "extreme vetting" programme to limit immigration to the US from countries that are believed to be at a heightened risk of terrorism. He had previously called for a "total and complete shutdown" on Muslim immigration to the US. Hassan Omar, president of the Somali Community Association in Columbus, Ohio, spoke to Artan's mother, who said he had driven his siblings to school as usual on the day of the attack. "He woke up and he went to school," Mr. Omar said, relaying the conversation that he had with Mrs Artan on Monday afternoon. She told him that she did not know anything was wrong until police arrived at her house. Minutes before the rampage, Artan posted to Facebook about "lone wolf attacks". He said that "we will not let you sleep unless you give peace to the Muslims. You will not celebrate or enjoy any holiday". His post also complained about treatment of Muslims around the world. He warned that some Muslims were in sleeper cells, "waiting for a signal. I am warning you Oh America!" But a friend said the attacker "actually loved America". Ameer Kadar, who last saw Artan two weeks ago, told NBC News: "He loved the fact of the opportunity he had here to go to school. "He loved the fact that he was able to get a college degree." Artan grew up in Somalia, but moved to Pakistan in 2007.